The cribriform plate a.k.a. lamina cribriosa is the horizontal lamina which connects the ethmoidal labyrinths together with the perpendicular plate. The crista galli on each side. Two shallow olfactory grooves, in which the olfactory bulbs of the cerebrum are located. 2. Numerous foramina penetrate this part of the bone for the conduction of the olfactory nerves. Those towards the medial and lateral sides of the channel are the biggest and most well arranged. 3. 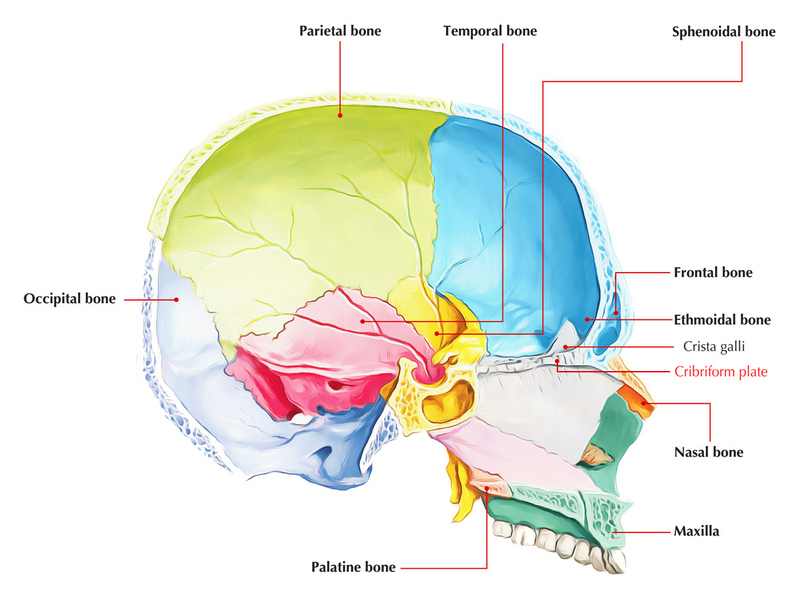 Two notches can usually be categorized along the lateral edges of the cribriform plate; they create the medial openings of the ethmoidal foramina when they combine with the frontal bone. 4. There is often a groove leading forwards from the anterior of these, which traverses to the side of the crista galli, where it terminates in an opening which enables the conduction of the anterior ethmoidal nerve towards the nose. 5. The cribriform plate joins the spine of the sphenoid posteriorly. At birth the ossified labyrinths as well as the cartilaginous septum are merged by a fibrous layer. Nearby the end of the first year, two centers emerge in the septal cartilage on both sides of the root of the crista galli. The crista galli and the perpendicular plate ossify from them along with the medial portion of the cribriform plate; a medial extension of the labyrinths creates the lateral portions. Near the fifth or sixth year, ossification is completed. Among the cribriform plate and the sphenoid linking has occurred about the age of 25 bony, but till the 40-45 years of age ankylosis in the middle of the perpendicular plate as well as the vomer is not normal. 1. Leak of cerebrospinal fluid into the nose and loss of sense of smell can arise due to a fractured cribriform plate. 2. A pathogen, Naegleria fowleri may get transmitted by the tiny openings of the plate conveying the olfactory nerve. The olfactory bulb and the adjacent inferior surface of the frontal lobe of the brain get destroyed by this amoeba. The site of increase of the trophozoites of Naegleria fowleri and their subsequent spread to the rest of the brain and CSF starts from this surface. 3. By utilizing a “Transcribrial Route Device” the same route to administer drugs at an early phase of infection has been suggested in order to exterminate this pathogen on site of its maximum multiplication. 4. Burkholderia pseudomallei, bacterium starting the tropical disease melioidosis, by transversing the cribriform plate can infect the brain via the olfactory nerve in 24 hours.